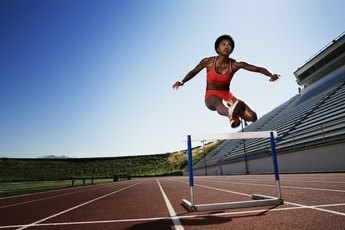 Plyometric exercise is often used by athletes, but you can use it as well. Plyometrics is not for the faint of heart or the weak of muscle. Based on explosive movement -- like jumping from a squat position -- and loading the muscle eccentrically, or in the lengthening phase, plyometrics are often used to condition athletes who want to increase speed and power. However, plyometrics have also proven effective in building the upper body. Plyometric exercises for your arms can be a little easier to execute than lower body exercises, but they are not for beginners. The fast movement and high impact mean a high risk of injury if your muscles aren't already strong. Play catch with a friend. Using a medicine ball, work the biceps and triceps as well as the shoulders and pecs. Stand facing a partner with your feet about shoulder-width apart to provide a strong base and your knees slightly bent. Contract your abs and don't allow your back to arch -- this is where the core comes in. Start with the medicine ball against your chest with your elbows out. Toss the ball to your partner by explosively pushing it away from your chest until your arms are extended. Your partner should anticipate the ball with her elbows slightly bent to absorb the impact, then pull it into her chest and toss it back. This should be done as fast as possible. Toss the medicine ball from an overhead position. This time place one foot forward and hold the ball over and slightly behind your head with your elbows bent as you would for a triceps extension. Forcefully bring your arms forward attempting to throw the ball when it is over your head. Try to catch it above your head as well. ExRx.net suggests starting slowly and gradually increasing the speed throughout the session. Assume a classic pushup position on your hands and toes to work your pecs along with your triceps and anterior deltoids but place one hand on a medicine ball. When your arms are extended your hands will be under your shoulders. Start by lowering your chest as close to the ground as possible, then push hard so that the hand that is not on the ball comes off the ground. Again, the movement is faster than a standard pushup. Progress to a clap pushup by assuming the same plank position for your pushup but with both hands on the ground. After lowering your chest as close to the ground as possible, forcefully push up so that your hands come of the ground. You can clap once before putting your hands back in position and lowering yourself down again. As these are difficult exercises, aim for completing no more than 10 in a set, if you can do that. BrianMac Sports Coach recommends a rest period of as much as five minutes between sets. These exercises will put more impact on your wrist than standard resistance exercises. Consider wrist-strengthening with light dumbbells before attempting these, even if you are well-toned in other areas. Do not attempt these exercises if you have a history of shoulder, elbow or wrist pain or injury. As women may develop osteopenia or osteoporosis in their middle years, you should consult a physician before considering a program of plyometrics. What Does Plyometric Exercise Mean? What Is a Plyometric Routine?